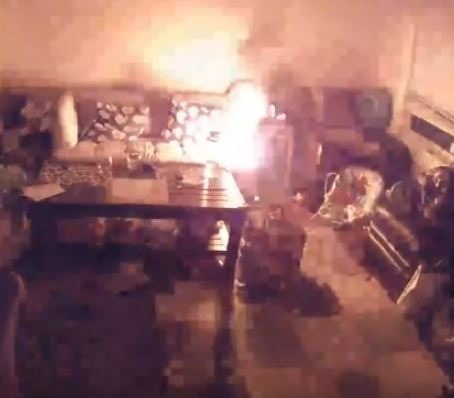 Home Cool stuff Drone Lithium Battery Almost Burns House Down! You think it won’t happen to you but like all tragedies it absolutely can happen to you. We read about cell phone batteries and other electronic gadget batteries spontaneously catching fire and causing a lot of damage and think that it couldn’t happen to me. Well that is what our own Doug Simmons was probably thinking when he plugged in his drone batter to recharge for another flight when it caught fire on his coffee table. It’s interesting to not only watch the initial combustion of the fire but to listen to it also! Several minutes go by before the fire detector goes off and a very upset, but savvy wife puts the fire out. Of course all of this is caught on his Nest Nanny Cam. The manufacturer of the drone Banggood offered to reimburse $7 for the battery. You don’t see much better customer service and pride in workmanship than that. With the tsunami of low cost drones and rc play toys flooding the market it is worth noting from this video that charging your batteries should be done while there is supervision and someone who can avert disaster like Doug’s wife. Hat’s off to her for getting that fire handled and not killing Doug.